Belly fat is both visceral AND subcutaneous fat. An MRI or CT scan is the most precise way to measure how much visceral fat you’re carrying around, but it’s costly. NOTE: Researchers are developing a blood test to measure visceral fat stores using RBP4 as a biomarker. There is a strong connection between increased levels of visceral fat and increases in RBP4 levels. If you have an oversized belly, it isn’t critical to know how much is visceral and how much is subcutaneous — just know it’s unhealthy regardless. Measure your waist at your belly button (the umbilicus). Your waist size is a simple reliable measure of your belly fat. Your waist should be half of your height. For example, if you are 6’ tall (72”), your waist should be no more than 36” around. Waist size increases the risk of diabetes in men. A waist of over 40 inches increases risk by 12 times. A 38 to 40-inch waist increases risk by 5 times. Thin People Have Belly Fat Too! Thin people can have visceral fat. You don’t have to be overweight to have too much visceral fat. In one study, thin people were more likely to have too much visceral fat when they were INACTIVE despite watching their diets. Many menopausal women transform to being apple-shaped. When you drink alcohol, your liver burns alcohol instead of fat. The result? A “beer belly”. Eat foods high in WATER and FIBER (low in calories, nutrient dense), such as fresh fruits, vegetables, beans/peas, hot cereals, pastas, potatoes, sweet potatoes, corn. Avoid DRY and/or FATTY foods (calorie dense), such as breads, bagels, dry ready-to-eat cereals, pretzels, nuts, cakes, cookies, cheese, chips. Go natural. Processed foods are often loaded with trans fats, sugar, and salt which boost belly fat. Reduce stress and don’t skimp on sleep. Stand up and move. The average adult burns 100 calories when walking one mile. Walking 5 miles (10,000 steps) burns 500 calories. Doing sit-ups, crunches, and other ab exercises will NOT eliminate it. It’ll strengthen the core muscles (your abdominal “girdle”) that hold in your belly fat, but won’t get rid of it. Fit Tip: The good news… you’ll tend to lose slightly more of the dangerous visceral fat first. 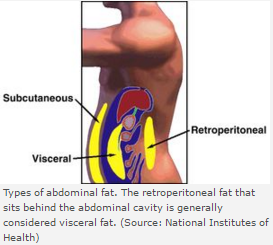 Since visceral fat is biologically active, it’s broken down quicker than other fat since it uses energy (calories). Stay accountable and monitor your progress. Weigh weekly. Measure your waist size monthly. Posted on June 24, 2018 December 11, 2018 by Karen OwocPosted in ♥ DAILY DOSE, Anti-cancer, Cardiovascular Health, FIT TV | VIDEOS, FOOD ED| NUTRITION, Heart Health, Heart Healthy, Lifestyle, Longevity, TV | Healthy Aging, TV | Weight Control, Type 2 Diabetes, Weight ControlTagged Alzheimer's disease, belly fat, cancer risk, dementia, health risks, heart disease, hypertension, Karen Owoc, KRON 4 News, Marty Gonzalez, obesity, type 2 diabetes, visceral fat. Next Next post: KRON 4 | What Would Happen If You Ate 20 Servings of Fruit a Day for Several Weeks?